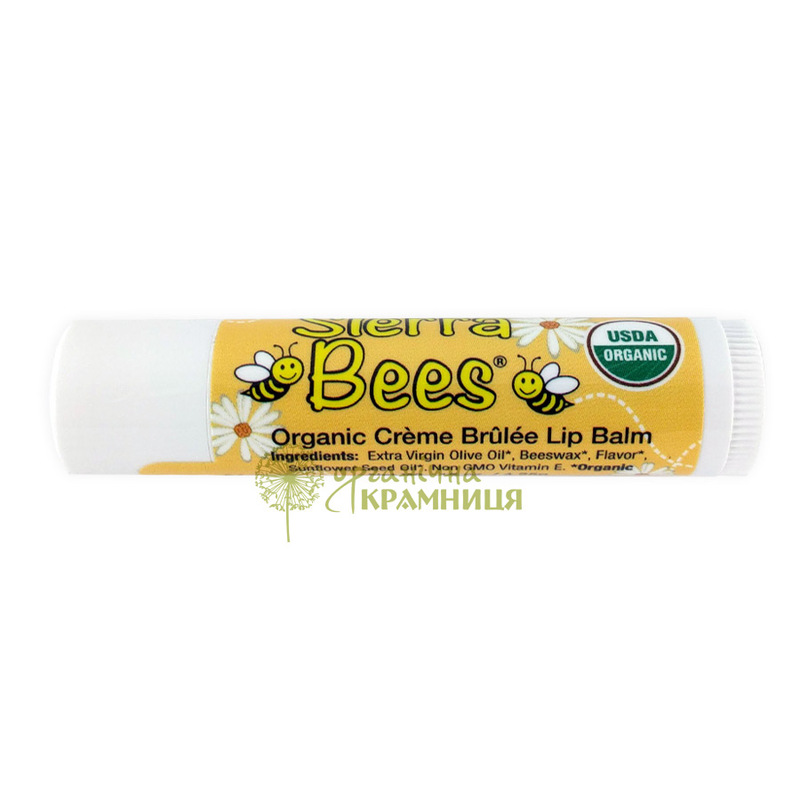 Certified organic Crème Brulee Lip Balm, formerly known as Vanilla Lip Balm, is produced by the US brand Sierra Bees. The product is formulated with organic beeswax, organic sunflower seed oil and organic extra virgin olive oil. Enriched with non GMO vitamin E.
Effect. The lip balm effectively nourishes and moisturises your lips, keeps them hydrated and conditioned. It makes your lips incredibly soft and smooth, protects them against wind, sun and cold temperatures, prevents dehydration, chapping and cracking. Free of synthetic ingredients, parabens, phthalates. USDA certified. Directions. Apply onto lips. Reapply when necessary. Ingredients. Extra virgin olive oil*, beeswax*, flavor*, sunflower seed oil*, non GMO vitamin E**. Want to buy Crème Brulee Lip Balm? Call us or submit your order via our web site! Sierra Bees (previously known as Madre Bees) is an American cosmetic brand. It is famous for its products formulated with organic beeswax and other bee products. The company has been producing organic lip balms, lip shimmers, creams, lotions, salves and baby products for a long time. All these products contain high-quality beeswax purchased from well-established bee farmers. Raw materials for cosmetic production undergo a thorough quality control because they must meet all the requirements of the US Department of Agriculture. To obtain a quality certificate, beeswax must comply with the economic and social requirements, and its production must not harm the environment. USDA certified organic beeswax is cultivated with the utmost care in order to ensure the sustainability, safety and health of bees. Sierra Bees cosmetics are formulated with bee products and natural oils. They are free of synthetic colourants, fragrances, preservatives and thickeners which makes them completely safe for kids and people with extremely delicate and sensitive skin. All lip balms are certified organic and gluten free, enriched with non GMO vitamin E.